Tune In God is walking in the garden (Dave Brown) A gentle song perfect for Easter. Free downloadable songbook and recordings. **TiS 383 Joyful the morning when Jesus Christ is risen (Traditional Torres Strait Islander) It's beautiful and joyful and from the Torres Straits! We should sing this! I can't believe I hadn't noticed this song before! Sound sample. Tune In Making things new (Sheree Anderson). A groovy one. Great for kids, and lots of fun. Free downloadable songbook and recordings. Good for kids. BUC Song Project I will sing of love / Celebrate (Dave Brown) A song that celebrates new beginnings and the beauty of creation. It's a bit like a salsa. It's cool. CH408 At dawn the women made their way (Mary Louise Bringle) Lovely gentle lyrics of the women discovering the empty tomb to an old tune that may be familiar (VOX DILECTI). Lyrics (pdf). BUC Song Project Jesus set me free (Dave Brown) Celebrating Jesus' presence and the freedom we have in Christ. It will need to be sung by the musicians first, I reckon. Tune In In the shape of a cross (Dave Brown) A cry to God for help and a call for God to enter our world. Free downloadable songbook and recordings. GtG229 In the darkness of the morning (Adam Tice) Excellent story telling song; particularly good for a dawn service. Sung to a simple Latvian folk tune. Sheet music sample. TiS 660 / CP235 Myrrh-bearing Mary From Magdala came (Rae Whitney) A song that follows the Marys involved in the adult life, death and resurrection of Christ. Sheet music and sound sample. Iona (LFB) / CH409 / A&M206 / SP079 / StF304 Jesus is risen alleluia! (Bernard Kyamanywa) From Tanzania, and set to a traditional Tanzanian melody. Pretty good and straightforward. The use of a small group to sing the harmony "responses" would be great, and particularly wonderful at an Easter Vigil or at the start of an Easter Morning service. 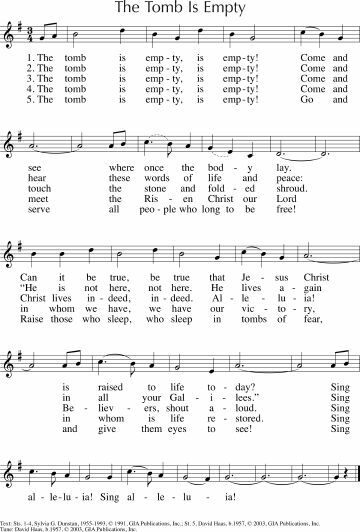 *GC(II)464 / CP230 The Tomb Is Empty (Sylvia Dunstan) This one is so joyful it gives me goosebumps! It would be a great start to worship on Easter Day. The verses say "Come and see", "Come and hear", "Come and touch", "Come and meet", "Come and serve". Lyrics and sample sheet music. Sound sample. CH407 Comes Mary to the grave (Michael Perry) Simple words focused on the peaceful morning and Mary's joy at finding the risen Christ. Tune is simple, but will need to be taught. Lyrics & sheet music. CH422 / AA015 Christ is alive and the universe must celebrate (Shirley Murray) Good celebratory Easter words. The tune will need to be taught. Lyrics and sheet music. *Iona / CH430 / SFFS2115 / GtG231 / G(II)308 / GC452 / GC(II)465 / G(3)530 / StF296 Christ has risen while earth slumbers (John Bell / Graham Maule) There are a number of tune setting for this. I prefer HOLY MANNA. Lead sheet. Sound Sample. New words to old tunes. TiS 393 / GA365 / Lau270 Christ is alive with joy we sing (Pamela Stotter) Joyful alleluias, and Easter images of Christ as grain of wheat, rising sun, vine and bread. Sung to the familiar tune VULPIUS. VU253 / G(II)2 / GC2 / GC(II)2 / G(3)003 / URW178 Sing Your Joy Proclaim God's Glory (God is alive) (David Haas) Easter hymn. A good opening song for worship. Each verse ends joyously "God is alive! Allelluia". Quite straightforward to sing. FFS55 Relentless lover God in Christ (Marnie Barrell) Great words! Can also be sung to KINGSFOLD if you don't want to explore a new tune. Lyrics. GtG242 Day of delight and beauty unbounded (Delores Dufner) A joyful 16th century dance tune, and happy lyrics of salvation and life! GtG241 / Cha223 Woman Weeping in the Garden (Daniel Damon) Great words about the woman weeping, then waiting, then walking, then weeping again, then dancing. TiS 363 / AHB 281 / NCH244 / CH431 / UMH317 / VU170 / LBW514 / ELW820 / A&M213 / GtG235 / PH116 / GC423 / GC(II)446 / G(3)532 / CP228 / CP(E)154 / W&R313 / Cha220 / 82Hml-203 / Lau280 O sons and daughters let us sing (Jean Tisserand) Many versions and many verses. AHB has emphasis on Thomas verses, but Gather hymnals have some nice verses about the women finding Christ risen. This tune can be really pretty cool - either as plainchant, hymn or fairly majestic contemporary mass music. Older version lyrics. Oldy-but-a-goody. TiS 242 / AHB 183 / AoV1-018 / ATN 27 / CH404 / UMH261 / VU352 / A&M667 / HPP163 / GtG157 / PH302 / G(II)481 / GC708 / GC(II)689 / G(3)796 / CP(E) 468 / W&R118 / Lau765 I danced in the morning / Lord of the Dance (Sydney Carter). Lyrics and tune sample. You all know this one, right? Good for kids Oldy-but-a-goody. ATW 452 Halle Halle / Why do you look among the dead (Robin Mann) Storytelling Easter song, with catchy hallelujahs. Lyrics. TiS 370 / AHB 290 / NCH367 / CH411 / UMH302 / VU157 / LBW128 / ELW369 / GtG245 / G(II)315 / GC437 / GC(II)439 / G(3)523 / CP206 / W&R288 / Lau273 / StF298 / MP076 Christ the Lord is risen today (Charles Wesley) It's not quite Easter for me without this hymn, but be aware that the lyrics vary widely between hymnals. TiS is good, although some may not like the Kingly language. If you want fully inclusive language, the NCH has good lyrics. An example of lyrics and tune. Oldy-but-a-goody. TiS 392 At the dawning of salvation (Jock Curle) Good hymn words of Easter theology and Christ’s presence at Creation to a fun standard American folk tune (NETTLETON). New words to old tunes. TiS 367 / AHB 287 / NCH242 / CH412 / UMH306 / VU159 / LBW135 / ELW366 / A&M217 / GtG236 / PH119 / GC446 / GC(II)459 / G(3)525 / CP212 / CP(E)159 / W&R290 / Cha221 / 82Hml-208 / Lau275 / MP670 The strife is o'er the battle done (Francis Pott) There are two possible tunes for this hymn. I prefer to sing it to the tune by James Minchin (THE STRIFE IS O’ER), which is found in the Australian Hymn Book, rather than the more traditional minstrellish VULPIUS. The newer tune is pretty groovy (I loved it as a kid! ), and has lots and lots of alleluias. The words also vary a lot between hymnals. So, the best would be a combination of the TiS words and the AHB tune 287 (ii). Yeah, this was my other church rock favourite of 1979. ELW375 / HPP199 / GtG253 Alleluia Christ is arisen / Aleluya! Cristo resucitó (Luis Bojos) A cool Latin American hymn. I would sing the refrain twice each time because it's short, and so joyful! ATA 160 The Son is up the Word is out / Resurrection shout (Robin Mann) A bit silly, but could be fun on Easter day with lots of kids. Good for kids. *ATW 445 Roll the rock (Leigh Newton) It’s a bit silly, but very joyous, catchy and Good for kids. TiS 381 / AHB 302 / NCH232 / CH415 / VU177 / WoV676 / LBW149 / ELW391 / A&M219 / GtG244 / GC434 / CP(E) 161 / W&R308 / 82Hml-192 / Lau286 / StF314 This joyful Eastertide (George Woodward) A fairly old-school traditional hymn; still good! TiS 387 / CH416 / UMH318 / VU158 / PH108 / LBW363 / ELW389 / A&M199 / GtG246 / PH108 / CP(E) 140 / W&R312 / 82Hml-182 / Lau272 / StF297 Christ is alive Let Christians sing (Brian Wren) Excellent words of Christ's saving, and still relevant grace. A couple of tunes are offered in different hymn books. I prefer TRURO. Lyrics, sound sample and sheet music. *Iona (TI1AU) / MV038 Glory to God / Nzamuranza (Mozambique / Matsikenyiri) Simple African call and response song. Great harmonies and particularly good for Easter Day. Thanks to Noodle Thrower for this suggestion. FFS21 Forgive us O God (Colin Gibson) Touching lyrics of the ways we have crucified Christ again, and the hope we have in Easter. A more solemn prayer of confession than is often used on Easter Day, but could work well. Of course, you might like to sing an Alleluia! Here's a list!. TiS 728 Jesuchristo reina reina ya! (Unknown) A fun Latin American song. It's particularly fun if someone is brave enough to yell out a "call" at the start of each verse. Good for kids. Iona (Love From Below) / CH434 / CP232 Jesus is risen from the grave (John Bell) Good, simple rhythm and tune. You can even make up some verses if you like. Good for kids. Taizé / ATA 107 / VU247 / GC555 / CP308 / W&R303 / Lau691 Jubilate Deo (Praetorius) A very simple fun round from the community at Taizé. Sound sample and practice parts. Good for kids. 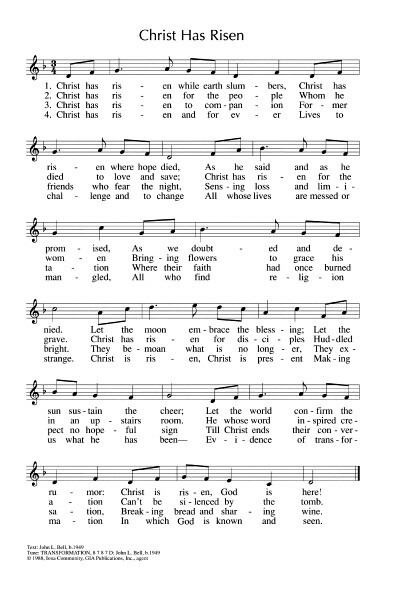 82Hml-713 Christ is arisen / Christ ist erstanden (German hymn) An ancient Easter Day round. *CH753 / SFFS 2078 / GtG589 / GC(II)271 / G(3)338 / PfAS147A Alleluia alleluia (Glover / Honduras) I would just sing the refrain of this. It would make a great introit or postlude for Easter Day. Sheet music and lyrics (chorus only). I'm not wild about the sound sample, but it gives you some ideas. *ATW 463 / Iona (T1AU) / ELW721 / SFFS 2219 / A&M835 / GtG750 / GC(II)451 / G(3)528 / W&R296 / URW436 Goodness is stronger than evil (Desmond Tutu / Iona) Words from Archbishop Desmond Tutu. "Victory is ours, victory is ours, through him who loves us". Some congregations change the last line to "Compassion is ours, compassion is ours...". It depends on the context in which you sing it, I suppose. Sound sample. Good for kids. TiS 541 / CH674 / WoV722 / ELW535 / GtG538 / G(II)394 / GC562 / GC(II)529 / G(3)626 / CP082 / SP&P190 / W&R709 / ZSS198 / URW400 Hallelujah we sing your praises / Haleluyah! Pelo Tsa Rona (Traditional South African) Joyous and simple song. Sound sample. Sheet music sample. Good for kids. *CH797 The Lord is risen from the dead (Dimi Halleyi) Simple chant, that can be sung in a round for Easter day. I will suggest some of these again next week, so this could be a good time to introduce a new song. Linnea Good / MV008 And on this path (Linnea Good) An energetic gospel style song. Here's a youtube video. We sing it much slower than this and as a gospel style song with big chords and a groovy bass part. I thought I'd never say that we sing something slower than anyone! Good for kids. *Taizé / MV016 / StJ / ELW528 / GA430 / SFFS 2157 / HPP410 / G(II)398 / GC570 / GC(II)550 / RS710 / CP402 / URW378 Come and Fill our hearts/ Confitemini Domino (Jacques Berthier) Can be sun in English as "Come and fill our hearts with your peace, you alone O God are holy. Come and fill our hearts with your peace, Alleluia". Sound samples and sheet music. MV187 / ELW682 We give our thanks / Reamo leboga (Traditional Botswana) A great song to sing for the offering. Video of some guys and a keyboard having fun with it. Good for kids. TiS 48 / AoV1-153 / ATOK 411 / VU808 / WoV779 / ELW787 / GA452 / HPP385 / G(II)433 / GC611 / GC(II)593 / G(3)691 / CP531 / W&R438 / PfAS091E / Cha077 / Lau952 You who dwell in the shelter of the Lord / On Eagle's Wings (Michael Joncas) This is a big favourite all over the place. It has masculine imagery for God. 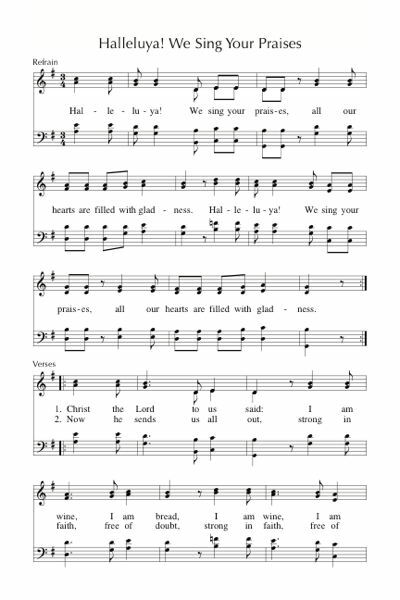 This doesn't have to be sung slowly and meditatively - it also works very well as a more upbeat song. If it is not familiar to you, a cantor can be used for the verses. It is not inclusive in all sources. *Cry Hosanna 14 This, this is the day (Brian Howard) I really like this song. Here are the lyrics, but I can't even share a tune with you. If anyone out there recognises the lyrics, I'd love it if you could share the source. Here's a youtube version; a little more strident than I would sing it, but it will give you an idea. What will you be singing? If it's something not listed here, please let me know in the comments below. 469 TiS fits in well with Easter. It has a good tune, or Darwall is a good substitute. Thanks so much Natalie - I love the treasures you find, old and new. What communion hymn do you recommend for this Easter? We sing "This is the day" from 'Scripture in Song Book One - Songs of Praise'. That version is by Les Garrett, and has only one verse. The others in your link fit quite well of course. It's catchy and fun and has easy guitar chords as well as piano score.